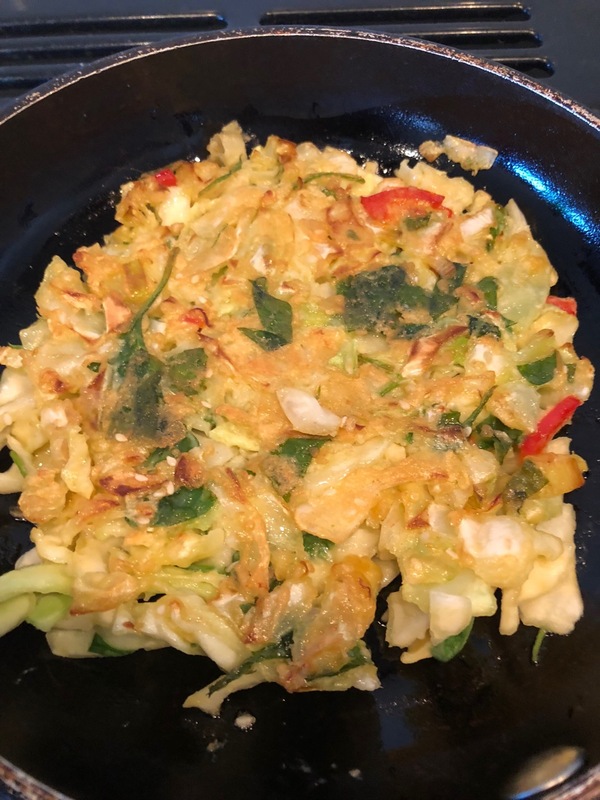 My *”Oh-My-Goshi “pancakes today are based on the traditional Okonomiyaki Japanese cabbage based pancakes. The name comes from Okonomi meaning “how you like it” or “what you like” and yaki meaning “grilled”. 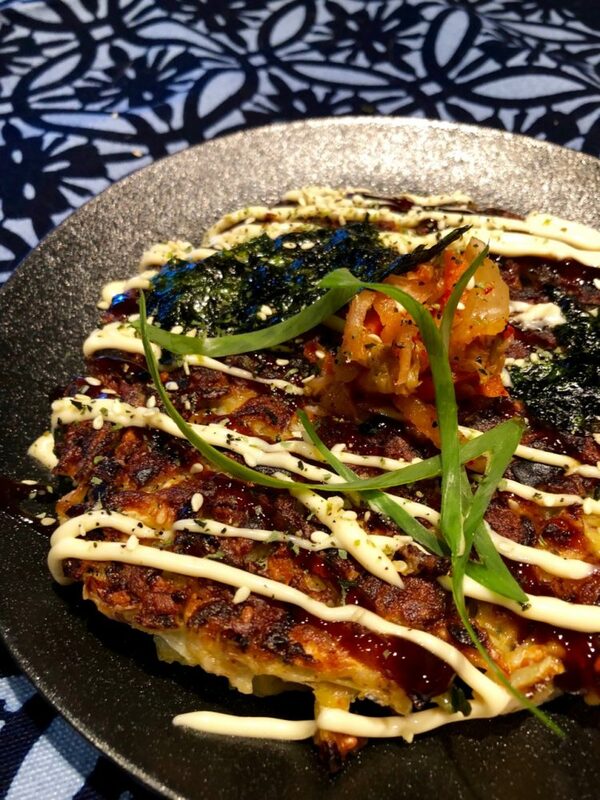 Served most often with a variety of umami laden condiments, most photos will show them presented with sweet Kewpi mayonnaise, brown Okonomiyaki sauce and bonito flakes. This is my version of these pancakes loaded up with lots of vegetables and then loaded again with tasty condiments. Sometimes I choose to add prawns to these for their delicious seafood crunch, complimenting the seafood flavours from the bonito flakes and seaweed, but they are equally delicious without. Although its very hard not to love the Kewpi mayonnaise and brown sauce, it is fun to play around with other possibly healthier, probably heretic, options such as a cashew or avocado cream and kimchi. 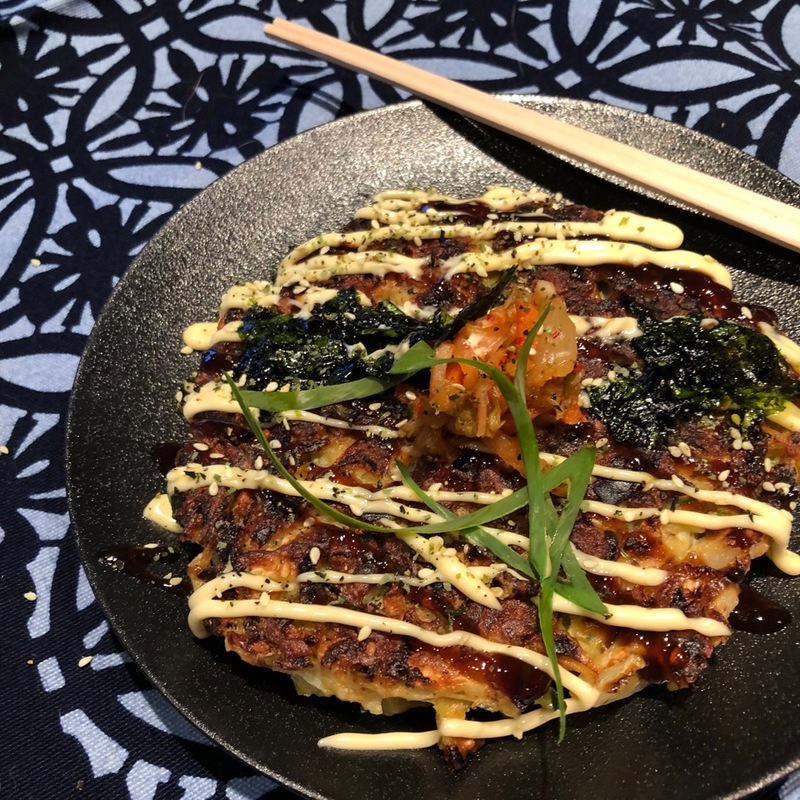 For the rest, the toppings add to the fun and complexity – they can be as simple as a few ingredients sprinkled over top, or built up like a salad on top of the Okonomiyaki. Try some baby greens, finely chopped spring onion, shredded nori, bonito flakes, seaweed seasonings such as this Citrus Furikae and maybe some Togarashi the Japanese seven spice mix to fire it up a bit, some avocado would be great to when in season. The most important thing to remember when cooking these dense pancakes is to allow time for them to to cook slowly so that the batter is cooked through. Doughy pancakes won’t be delicious. Traditionally made with white flour I mostly use gluten free flour when making these. The off the shelf brands will work well but if it is looking too loose you can add a couple of tablespoons of ground linseed which will help act as the glue to bind them together. Don’t be put off by the long ingredients section as this is mostly a list of options so you can make them your own. 1 or 2 medium sized nonstick pans – it is quicker if you are in a hurry to cook two pancakes at a time and because of the way they need to cook slowly not stressful. Stack them up like pancakes and pop in a warm place until you have cooked them all. Using a very large bowl lightly beat your eggs. Whisk in the rest of the dry ingredients, water or broth, and oil to form a batter. 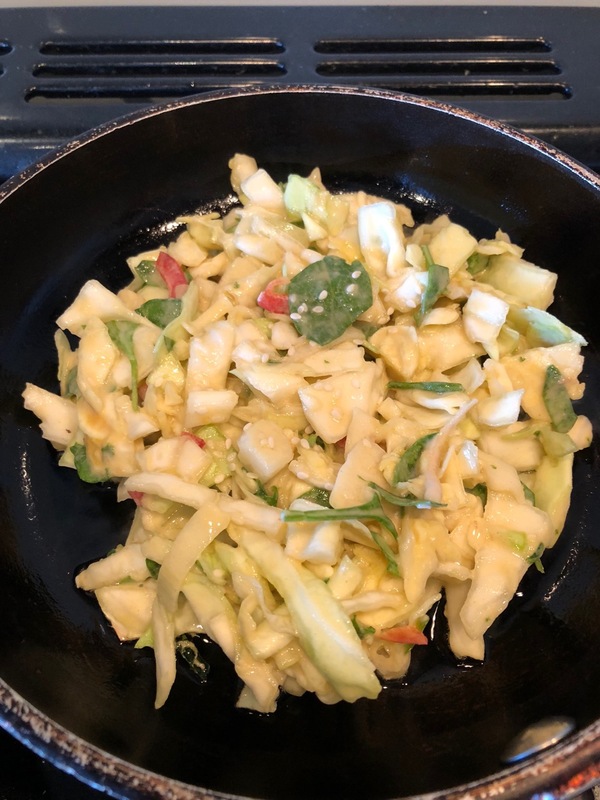 Mix through the rest of the ingredients and rest for half an hour. Heat a non stick pan to a medium temperature with a couple of tablespoons of olive oil. Using a large spoon add enough batter to make a pancake that is about 1 1/2 – 2 centimetres thick when pressed down. Once it starts cooking ensure it is on a medium temperature so as not to burn, press the top down a little, tidy the edges and put a lid on the pan – allow your pancake to cook for five minutes – you can carefully check the bottom of the pancake as you go to ensure you have the temperature correct and they are browning slowly. After five minutes the bottom should be light to medium brown and be firm enough to turn over. Carefully turn your pancake replace the lid and cook for another five minutes, before turning again to give a final crisp bottom to the pancake. Keep on with this process until all the pancakes are cooked. At this point you can serve the pancakes pre loaded or put your condiments in an array of bowls on the table for everyone to make their own choices. *I originally called these pancakes Oh-My-Goshi as a mark of deference, acknowledging my lack of real knowledge and any training in Japanese cuisine and culture. I liked that this slightly kooky name emphasised my enthusiasm for the umami goodness inherent to this incredibly complex cuisine.